Last week, Xylon and I were in the Kruger National Park for 8 glorious days. The phone didn’t ring, emails didn’t ping, social media was ignored. We spotted buffalo and elephant as we drove through the park’s gates, then nothing for a while, and then giraffe. Hours later we saw our first cats, lions by a waterhole, tiny specks without binoculars.By the time we reached our campsite we had seen leopard too. 10-seconds of spots as it disappeared into the bush. On our last day, we climbed out our cars at our favourite lookout point, which drops down suddenly beneath our feet to a riverbed and then opens up to a savanna. As we walked across to the wooden barrier, I said something about an elephant in the distance. To the right of us we heard scurrying and turned to see two klipspringer move away from us to safety. Then Xylon heard a rustle in the bush and points, “There’s a rhino in the bush below.” We crouched low for a better view and saw an elephant breaking branches. Then Xylon pointed at three bright birds flying past. Wild parrots. We don't want to leave to keep standing there for a just a minute longer. It's never enough. When we came for 3 weeks we tried to figure out how to stay just a few more days. We never want to leave. My husband, Xylon, reckons it is because it is impossible to experience all the possibilities in the bush. When you’re there you never know what is just round the corner. It's impossible to experience all the possibilities, all the wonder, all the things God has for us. I leave full. Overflowing. But I know that I could take more. That I could never have too much. I think about how my relationship with God should be like that. Lost in the mystery of all the wonders to still to be experienced. Always hungry for more, trying desperately to figure out ways to spend longer in his presence. O True God, You are my God, the One whom I trust. I seek You with every fiber of my being. my soul is dry and longs for You. My body aches for You, for Your presence. There have been stretches in my life when I’ve had that feeling but it’s not consistent. It’s not an every day thing. As I left Kruger I thought about how I wanted that, how I want to always be aware of that I haven’t experienced all the wonders of God. I realised I probably need to be more intentional about it. One thing I’ve learnt is that if I don’t take action to change things, things stay the same. So I as we drove back I figured out a plan to create space in my life so spending time with God doesn't feel like a chore. I don't live in Kruger but I anticipate it. I book it. I am fully present when I'm there. I don't pick up my phone. I just absorb, enjoy, worship. Open my eyes to see all the wonders God has made. Pause to watch the sunset. Take note of the birds singing. Watch a giraffe awkwardly stretch it’s legs to drink. 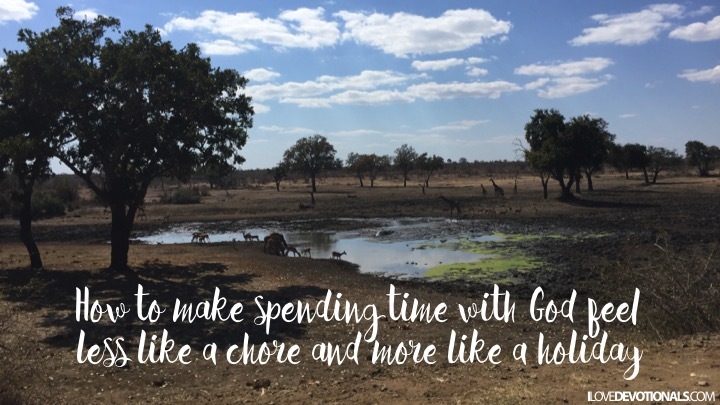 What can I learn from my Kruger experience that can help me look forward to spending time with God? I’m starting with my daily walk with Oliver, our dog. Viewing this as a moment to anticipate time with God. This works for me because it is already part of my daily routine so I can plan for it. It happens outside so it’s easier for me to not be distracted by work. At the moment it’s not super spiritual and it’s not long. It's just a few minutes on my walk when I talk to God, look around me and take in the wonders that he is surprising me with. This week it’s been all about wildflowers. It’s spring here and every day I’ve seen a new flower springing up in the field where I walk Oliver, a small reminder that when it comes to God there is always more to experience.